X-Ray Associates is pleased to offer DatScan SPECT Imaging services at El Camino Imaging Center. DatScan is the first-and-only FDA-approved imaging agent to help physicians determine whether patients have a parkinsonian syndrome (PS) such as Parkinson’s disease (PD). DatScan imaging may help physicians provide timely and appropriate diagnosis and treatment. An Estimated one million Americans are currently living with Parkinson’s disease, and approximately 60,000 people in the United States are diagnosed with the disease each year. These numbers do not reflect the tremendous number of people who go undiagnosed, as Parkinson’s disease (PD) and Parkinson’s syndrome (PS) can be difficult to differentiate from look-alike conditions such as essential tremor- a disorder characterized by trembling of the hands, head, and occasionally the arms and legs. As a result, effective treatment could sometimes be delayed while the patient and physician searched for answers. With the advent of DatScan SPECT imaging, specialists are able to evaluate patients with suspected PS and PD in a more timely fashion. 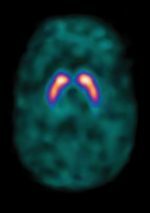 Here’s how it works: DatScan involves single-photon emission computerized tomography, or SPECT—a type of nuclear imaging test. During the study, a radiopharmaceutical is injected through an IV into the patient’s bloodstream. 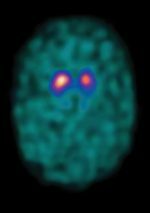 Then a special gamma camera takes 3-D pictures of the brain to assess the patient’s dopamine system, of which the dopamine transporter (DaT) is a component. Dopamine is a chemical that’s essential in controlling movement and other muscle functions. Images are then interpreted by a neuroradiologist. To schedule an appointment, please call 505-998-5925.